New Urban Arts: New Urban Arts Returns to the Woods! For the second consecutive year, in June the Studio Team Advisory Board went to Camp Aldersgate for an overnight leadership retreat to culminate the program year. Known best as “STAB,” the Studio Team Advisory Board is a collective of 13 students and alumni who are leaders in our studio community, organizing publications, events, and studio traditions such as ArtsGiving and the All Night Art Lock-in. They also advise the staff and the board of directors on key programmatic decisions and represent the organization to community leaders and supporters. 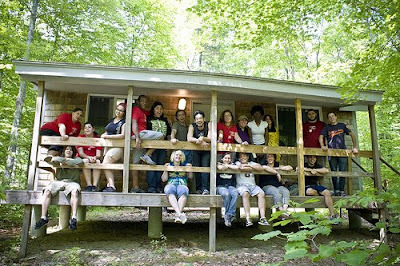 <?xml:namespace prefix = u1 /><?xml:namespace prefix = o />To celebrate and support the leadership of these students, on June 6 we held a retreat in the woods of Glocester, RI. We went hiking. Got lost. 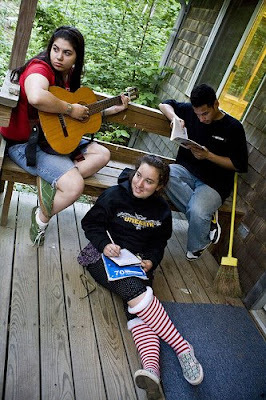 Hung out together in the community cabin. 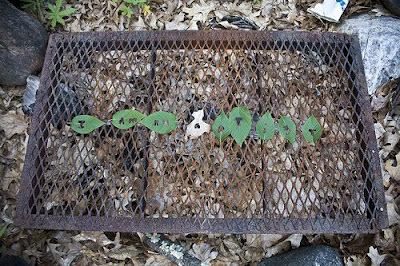 Made art using nature only, including flower bouquets, faerie dwellings, and leaf letter carvings. We went on a night hike after the sun set, wearing glow in the dark necklaces. We watched a surprise slideshow of pictures from the year played to songs such as If You Want to Sing Out, Sing Out by Cat Stevens. We filled up on smores and ghost stories, and tried making popcorn over a campfire. We played the question game late into the night. We went on a treasure hunt the next day. We played guitar and read books on face reading. We received limited edition “I Stabbed the Studio” tshirts. We wrote notes to each other in our “Campbooks” which were a cross between a yearbook, FaceBook and a key chain. We learned about our leadership styles through a favorite, the Leadership Compass which encouraged us to consider the way in which our style affects other members of the team. Then we had a picnic. “I loved the campfire! That was amazing," said one student. "But I also loved just being around each other. It was just a really great experience and I feel like I bonded more with the STAB committee. I also liked the CampBooks alot." 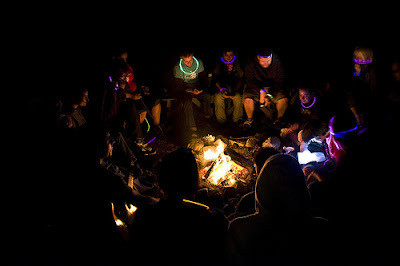 Each year, a highlight of the retreat for many has been the Ceremonial Campfire. First we write letters reflecting on the year. The letters begin, "Dear New Urban Arts." Later we read these letters aloud to one another around the camp fire. Many thanks to volunters Caitlin Cali, Zachary Clark, Jason Yoon, Jesse Banks III, Andrew Oesch, Melissa Small, Seth Gruenwald, and especially Emily Ustach for their help in making this retreat possible. And uh, a big congratulations to Sarah Meyer for making this happen and orchestrating a great weekend!